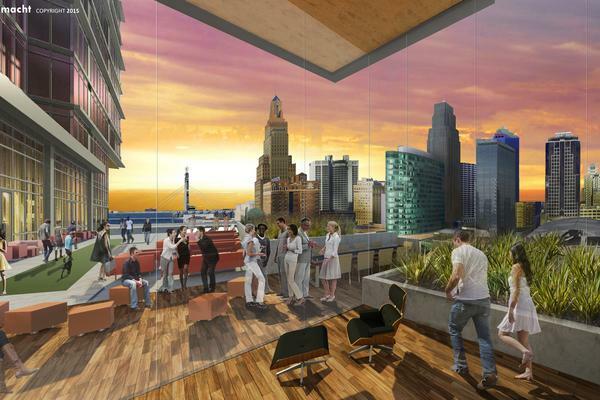 The second phase of Cordish’s downtown residential development, Two Light, will likely see rates in the neighborhood of $2.10 to $2.15 per square foot. Benjamin said Cordish is on the brink of announcing construction plans for Two Light, which will go up at 14th and Grand, across from the Sprint Center on the north side of Truman Road. In addition to the building’s planned 5,000 square feet of retail space and 475-stall parking garage, Cordish is in talks now with a specific tenant for 20,000 square feet of office space. Look for construction to kick off shortly after the opening of One Light in the fall. And unfortunately is essentially the same appearance in terms of glass structure, which could look like 'the projects' with 3-4 buildings planned that look mostly the same. I wonder what the S side looks like... I suspect a blank wall. Am glad to see the massive investment but sure wish they would use completely different designs/materials for each building and take the potential of 'the projects' appearance out of the equation. The decades view from Liberty Memorial may be very distracting with 'the projects' in front the skyline. I also wonder about the need for significant incentives. I'm cool with incentives to handle some infrastructure but do hirises in larger markets need incentives? Now that KC luxury rent has hit over $2/sqft, I'd be surprised - especially given construction costs are lower in KC than most larger markets. I wish they would have provided more images of this building from different angles. I'm curious as to how it will look on the south side of the building facing Truman Road. Again, is the image showing a 'capped' I-670? The design of this one does look different and better in my opinion. 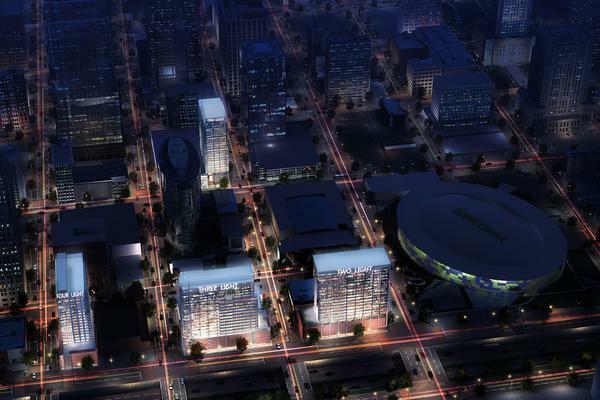 Will be curious to see the full renderings and south views. Looks fine to me. Wish they weren't preserving the surface parking behind it. Zorobabel wrote: Looks fine to me. Wish they weren't preserving the surface parking behind it. In itself it looks fine but not in context to the total 4 planned - all apparently looking mostly the same in terms of material design. Only thing behind it will be 670? Anyone else see my point about the blank wall that would dominate from Liberty Memorial view? Using completely different materials for each building with different designs would keep things mixed up and not distract the view. It looks like communist era block housing. Remember when the Sprint campus was supposed to look like an Ivy League campus and ended up looking like a prison compound? Act now before it's too late. I don't care that one light and two light look the same but I'd hate to see three light built right across the street with the exact same design. Hard to complain so far though. Last edited by joshmv on Thu Apr 09, 2015 8:02 pm, edited 1 time in total. I for one will take repetitive designs for 1800+ new residents downtown. my favorite is all the discussion of blank walls to the south when we haven't seen a rendering of the other side... and it's not as if the blank walls are bad if done right. the paintings on them today are some of the best things downtown. cityscape wrote: Again, is the image showing a 'capped' I-670? The design of this one does look different and better in my opinion. Will be curious to see the full renderings and south views. Last edited by flyingember on Thu Apr 09, 2015 7:39 pm, edited 1 time in total. I was trying to visualize what the south side would look like with all 4 towers built so I did a quick (translate: bad) photoshop. I didn't include #1 since I figured #3 would mostly cover it from this angle. If 83% privately financed is accurate, that makes it sound a bit better. Definitely better than Cerner @ Bannister. Last edited by pash on Mon Feb 13, 2017 3:20 pm, edited 2 times in total.